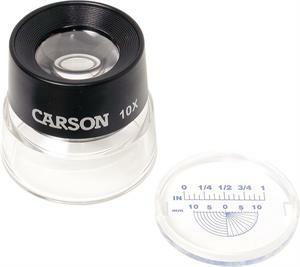 Carson LL-20 LumiLoupe is a stand magnifier with pre-focused dual lenses. It is ideal for close-up examination of objects, while its transparent acrylic base allows ambient light to illuminate the subject for bright, clear viewing. The snap-on reticle lets you make accurate measurements in both millimeters and inches. 10X Magnification. Lens Size 2" x 2" x 1.75"